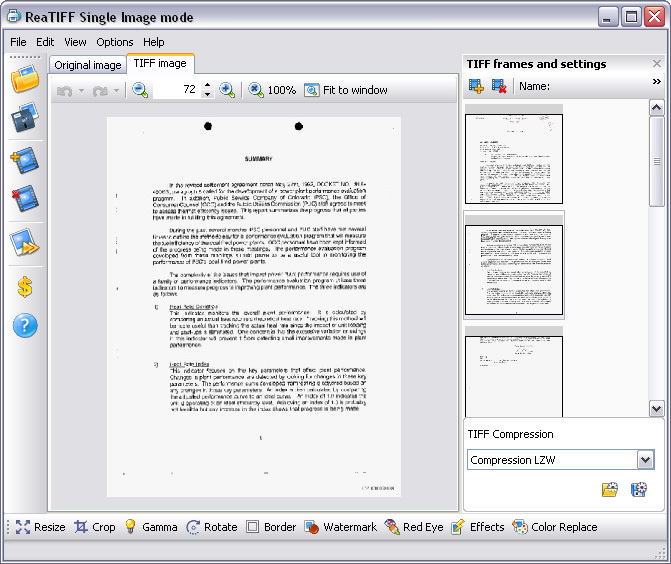 With the ReaTIFF Single Image mode you can convert your images to TIFF one by one. Usually you should use this mode when you have just a few images to convert and you want to apply some image processings to each individual image. Open your source image with "Open image" button or just drag-and-drop it from Windows Explorer. (optional) Apply image processings as needed. ReaTIFF image editor provides several popular image manipulation functions, including resize, crop, rotate, mirror, brightness, contrast, border, watermark, red eye correction and a dozen of various artistic effects. (optional) Adjust TIFF compression method if needed. Save your resulting image with "Convert and Save" button.